Netflix has gotten a lot of mileage out of the career of the drug kingpin Joaquin "El Chapo" Guzman in its scripted series “Narcos.” Now, the live streaming service is presenting a three-part docuseries entitled “The Day I Met El Chapo” that recounts a stranger-than-fiction real-life meeting between El Chapo and Latin-American actress Kate del Castillo and American actor Sean Penn. The story starts in 2012, when Del Castillo tweeted a message that stated that she trusted El Chapo more than she did Mexican government. The tweet caused a scandal south of the border, but also caught the attention of El Chapo, at the time on the run from the authorities after escaping prison. The tweet led to an exchange of text messages and then a secret meeting in the city of Sinaloa to discuss the possibility of making a film about the drug lord’s life. Penn showed up because he was involved in a brief relationship at the time and wound up writing an account of the meeting for Rolling Stone. Penn’s sympathetic portrayal of El Chapo caused a media firestorm at the time. What was he doing meeting in secret with a man who pushes deadly drugs and commits horrific murders as a way of doing business? Penn was unapologetic at the time. Now he is very angry because he feels that the documentary is filled with untruths and is sensational in the style of the National Enquirer. 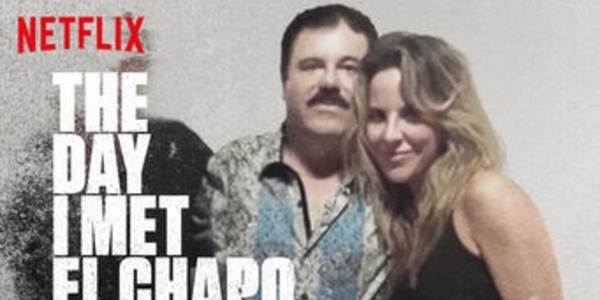 What “The Day I Met El Chapo” does is to portray the infamous meeting from the point of view of Kate del Castillo, an actress who is famous in Mexico and among Spanish-speaking audiences in the United States. She plays a drug kingpin in a popular series called “La Reina del Sur” (“Queen of the South.”) Unlike Penn, who sees the war on drugs as an excuse for oppression, Del Castillo does not have any sympathy for El Chapo, now in American custody awaiting trial for drug trafficking. As a Mexican, she is very aware of the violence and corruption that the illegal drug business has caused and has expressed the wish that El Chapo could have used his power and wealth to do good instead of evil. As for Sean Penn’s complaints, a Netflix spokesperson stated that he was given a number of opportunities to participate in the documentary series but declined to do so.